Does your baby need a quick shelter from the sun or bugs while on the beach or in your backyard garden? PLCEO Instant Pop Up Baby Beach Tent provides a safe and bug-free sleeping area for your baby. The Pop Up Baby Beach Tent can be folded down to a 14 inch (35 cm) disc at only about 450g, making it so easy to put inside your backpack and bring it along to wherever you and your baby go. Take it to the park, the beach, a soccer game, or simply in the living room for day-to-day use. Make sure you choose the PLCEO Pop Up Baby Beach Tent – the ORIGINAL & AUTHENTIC design of such baby beach tent. Unlike some knockoffs, our baby beach tent keeps refining its details to meet our customers' needs as much as possible. Baby Safety First – The fabric and ink of our baby beach tent use certified non-toxic, lead free, baby safe material. Our plceo baby beach tent comes with 2 tent pegs along with 2 anchor straps to hold the pegs. Now you can have a peace of mind and don't have to worry about the beach tent getting blown away. Two way zipper enable quick and convenient access to your baby inside the tent. plceo baby beach tent has an elastic strap that secures your folded plceo baby beach tent from popping open, avoids any unpleasant surprise and serious injury. We know that many parents have problems with folding up the beach tent. 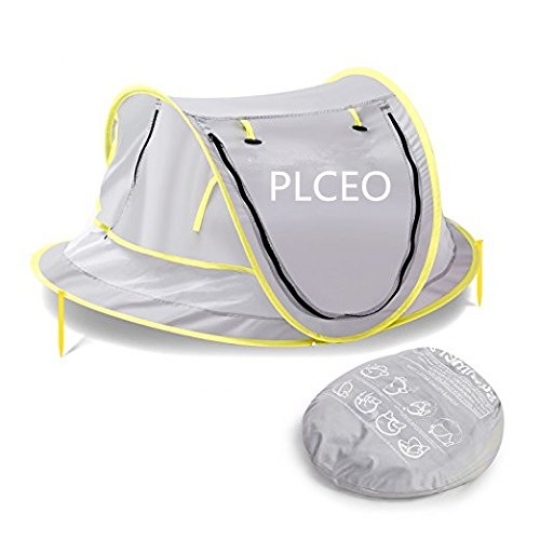 plceo baby beach tent has clear instructions printed on the cover of the carrier bag, as well as a video demo shown online to help you master the folding method and let you be able to fold up the tent in a few seconds.reserved.